I had the distinct pleasure of speaking with Marti Skold-Jordan, Manager of U.S. Partnerships at GSK. During this Diverse IT podcast, Marti and I talk about keeping young girls and minorities interested and engaged in STEM. You can tune in to hear about the importance of diversity in STEM and why it’s crucial to interest kids by middle school, GSK’s free national program Science in the Summer that’s for all children but especially targets young girls and monitories from underserved communities, and how parents can keep kids engaged in STEM. I found it so exciting myself, I was begging Marti to let me join them! When school is out, science is in! Our hands-on, free science summer education brings the magic of science to elementary and middle school children. Kids study oceanography, chemistry, physical science & electricity, genetics, bioscience, and simple machines. 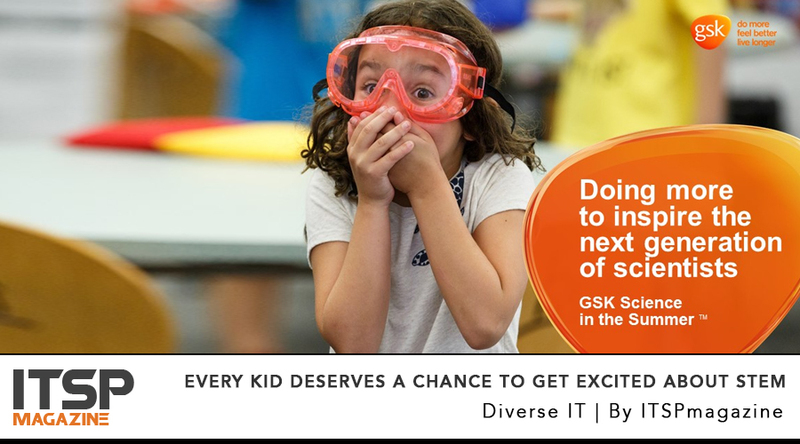 GSK Science in the Summer is available in locations throughout the nation including North Carolina, Philadelphia, and Washington DC/Baltimore. Our scientist Jeff demonstrates an easy, fun science experiment that you can do at home with your kids. All you need is a purple cabbage, a lemon, and white construction paper, and you've got a magic way to draw or write messages. Marti Skold-Jordan is Manager, U.S. Community Partnerships, at GSK, one of the world’s leading pharmaceutical and healthcare companies. GSK is committed to improving the quality of human life by enabling people to do more, feel better and live longer. Ms. Skold-Jordan is responsible for the Community Partnerships programs at GSK’s headquarters sites in the U.S.: Research Triangle Park, NC, and in Philadelphia, PA with a focus on STEM and Science Education. She was previously Manager of External Communications for GSK. Before joining GSK, she spent 30 years covering news and weather as a journalist in television markets around the country. She received her bachelor’s degree from Concordia College, Moorhead, Minnesota. Ms. Skold-Jordan is a two-time Emmy Award winner for Best Newscast in Los Angeles and for Science and Environmental Reporting.